The Union Square section of Somerville is an up-and-coming neighborhood for dining out, perhaps not yet at the level of, say, Kendall Square in Cambridge, but certainly on its way to becoming a destination spot for folks looking for a bite to eat. The slightly scattered setup of Union Square--plus its location relatively far away from any subway stops--helps create an area just meant for hidden gems, with some sections even a block or two away from the heart of the square having very little foot traffic. One such little-known spot is an easy-to-miss Thai restaurant on Bow Street called Sweet Ginger that, while only a stone's throw from the at-times hectic intersection of Somerville Avenue, Washington Street, and other roads, is in a quiet area with relatively easy street parking and a peaceful interior that is worlds away from the nearby traffic. Sweet Ginger is not a very big restaurant, and its relatively small space is made even tighter by the combination counter area/open kitchen that dominates the room. 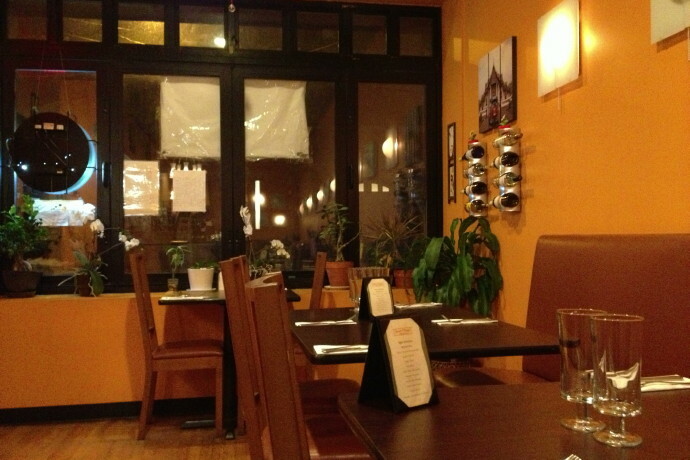 But it is a rather comforting and inviting place, with warm-colored walls, lights that aren't overly harsh, and an attractive hardwood floor, and because much of the restaurant's business is done by takeout and delivery, it is typically quiet and uncrowded. On a cold winter night the tables in the front can get chilly whenever the door opens, but because the space is long and narrow, sitting in the far back part of the room is toasty, even on the most frigid of nights. The name "Sweet Ginger" seems to make sense at this restaurant, as it appears that even some of the hottest dishes have a bit more sweetness and overall flavor than heat. The menu isn't pages long like at some Thai spots (such as the endless menu at the wonderful Dok Bua in Brookline), but there is certainly something for everyone here, including options for vegetarians, seafood lovers, meat eaters, and folks who need to stick to gluten-free dishes. A few of the highlights at Sweet Ginger include a miso soup that is a bit sweeter and richer than most; a beef soup that is also sweet-tasting, with much of it coming from carrots and sweet potatoes; a crystal soup with glass noodles, all kinds of veggies, and a savory broth; an excellent version of tom yum soup that has a deep fish flavor to it; golden triangles that are filled with lean ground chicken, mashed potatoes, and spices, and come with a delightful pineapple sauce; mushroom and cabbage dumplings that include earthy shiitake mushrooms and are served with a zingy and slightly sour ginger-sesame dipping sauce; tender fried calamari that is served with a bright-tasting mango salad; a sizzling seafood volcano dish that features mussels, shrimp, squid, and a number of vegetables, all in a spicy sauce; a delicious basil fried rice dish that has a little more in the way of sweetness than heat; a version of Pad Kra-Pow that, again, isn't overly hot but has a complex combination of flavors coming from the ground chicken (or beef), stir-fried onions and peppers, and basil leaves; a particularly good Pad Thai that can also be ordered with bean thread noodles and shrimp paste, and, for those who do like very hot dishes, a fiery beef platter that is served on a sizzling plate and is definitely not for the faint of heart. Beer and wine are offered at Sweet Ginger, and there is also a separate menu for bubble tea, with the taro and Thai iced tea options perhaps being the best, though the green tea and sparkling cream soda bubble teas are also very fine. The Boston area has a number of excellent options for Thai food, with many of them also being "hidden," including this terrific little spot on the northwest edge of Union Square. The combination of good food, low prices, friendly service, lack of crowds, and easy parking all help to make this a place that is well worth going to, and yet another reason to come to this part of Somerville for dining out. Copyright © 2013, 2014 Boston's Hidden Restaurants (www.hiddenboston.com).